We caught the airplane to Puerto Maldonado this morning. Truly strange having a 35min flight! They came round and gave us a tiny hard-boiled sweet, which turned out to be quite helpful for the ears. OMG, the heat hit us immediately like a wall as they opened the plane doors. Sweltering. After landing we got taken to our tour office where we had to leave our main luggage and took only what we needed for the next 2 nights. And then we had a bus trip along a very dusty road to the 'port' (really just a launch for the tour boats). 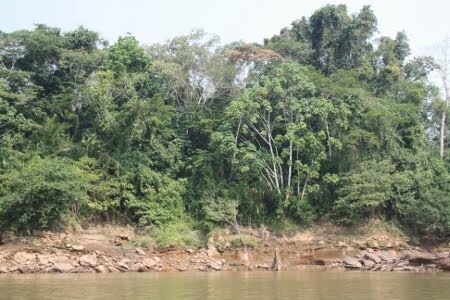 To clear up any confusion, we're not actually on the Amazon River, I think our river is called Rio Tambopata but we were also told it was called Madre de Dios (Mother of God). So, really, I haven't much clue where we were at all exactly. But we took the boats (long thin wooden boats with a canopy and everyone sitting down either side facing each other) along the river and were given lunch, which was wrapped in a banana leaf so that we could just drop it into the river when we were done and it'd be completely biodegradable :) The boat trip was about 45mins before we arrived at our destination, with about a billion more stairs between the shoreline and our lodge, Posada Amazonas. Arriving by boat was quite an experience because the river it especially low at the moment and we kept running aground in the sand banks. The lodge is pretty awesome :) It's completely open with a jungle view and no doors anywhere, just curtains. No electricity either. And the closest I'm likely to get to an outdoor shower for a while - I love it! We relaxed for a while, waiting for it to cool down a bit before we went on a walk to a tower, which we climbed up and watched the sun set and moon rise from, up above the jungle canopy. It was stunning but sadly my point-n-click camera is acting up so I didn't get any decent photos :( Will definitely get a new little camera before my next holiday, the slr is really just too much of a hassle on holidays like this! And then it was back to the lodge for dinner. Didn't stay up too late because we have a 4am start tomorrow. Is there a big difference in altitude between where you stayed on the river and where you were? Did you feel a difference?